Swirls of cheesecake run through this Chocolate Candy Cane Cheesecake Cake. 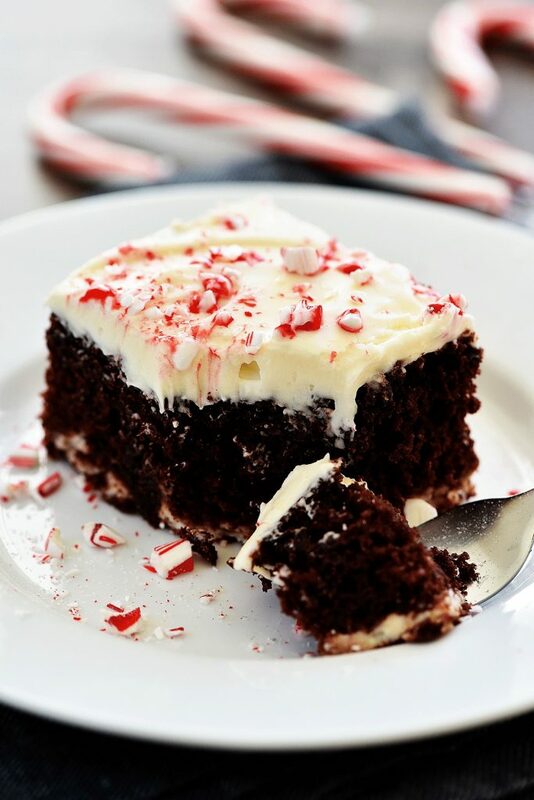 It’s then topped off with cream cheese frosting and crushed candy canes making one beautiful and delicious cake! When we do have our family party we assign everyone something to be in charge of. I usually end up bringing a dessert or appetizer. 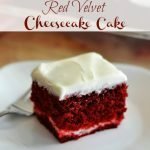 One year I made my Red Velvet Cheesecake Cake and it was a big hit! 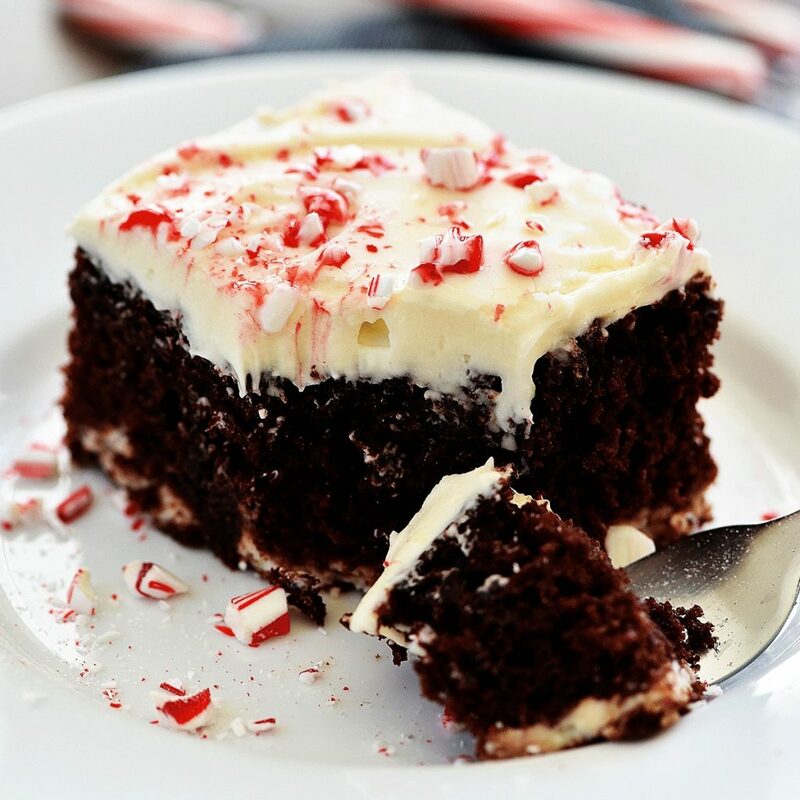 That’s where I got the idea for this CHOCOLATE CANDY CANE CHEESECAKE CAKE! It’s pretty much the same concept. Swirls of delicious cheesecake run through this chocolate cake. It’s topped off with cream cheese frosting and crushed candy canes! It is DELICIOUS! My little family of 5 went through this cake fast when I last made it. We loved the combo of flavors! I decided very quickly that this would be the treat I make for our Christmas eve party. It is so good! A divine chocolate cake with swirls of cheesecake and cream cheese frosting. 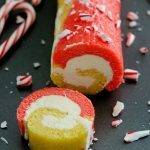 Crushed candy canes sprinkled over the top for a fun festive feel! 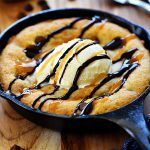 Preheat oven to 350 degrees F. Grease a 9×13 baking pan with non-stick spray. Set aside. Prepare chocolate cake batter, according to package directions. Set aside. In a separate bowl, mix together the (8 ounce) block of cream cheese, sugar and egg white. Beat together with an electric hand mixer, on medium speed, for 1-2 minutes or until combined and smooth. Pour only half of the chocolate cake batter into the prepared 9×13 pan. Spread out evenly. Then take the cream cheese mixture and drop spoonfuls all over the batter in the pan. Take the back of the spoon and swirl the cream cheese mixture all over the top of the cake batter. Pour the remaining cake batter all over the top of the cream cheese mixture. Carefully, spread the cake batter over the top evenly. Covering all of the cream cheese. 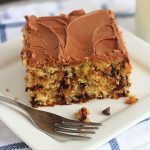 Bake for 38-40 minutes, or until a tooth-pick inserted in center of cake comes out clean. Let cake cool completely before frosting. FOR FROSTING: In a bowl, combine the cream cheese and butter. Beat on medium speed until smooth. Gradually add in powdered sugar, then beat in vanilla and milk, until smooth. Spread frosting on cooled cake. Sprinkle the crushed candy canes all over the top. Oh my word! This looks like it’d be the death of me. I was just coming to print off the bacon and queso breakfast taco recipe and this was posted. I think I know what I’ll be bringing to our get-together! 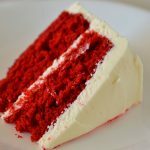 This is best cake recipe i have ever found.Thank you for describing it so perfectly.